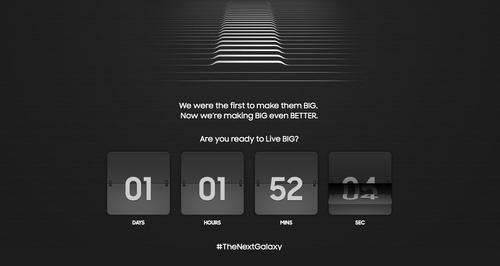 Samsung Electronics is counting down to the launch of the Galaxy Note 5 and the Galaxy S6 edge+. Samsung Electronics is hosting its second major product launch of the year in New York Thursday, with a lot riding on the expected debut of the large format Galaxy Note 5 and Galaxy S6 edge+. Carrying forward designs reminiscent of the existing S6 smartphones, the company is hoping make up for ground it has lost to the iPhone 6 Plus. Highlighting the pressure Samsung is under, the company has for the first time decided to forgo a launch at the IFA consumers electronics show in Berlin during the first week of September. This move will give it some breathing room before Apple launches its new iPhones at an event reportedly to be held Sept. 9. The Android camp has in general struggled to keep up with the iPhone 6 juggernaut. Since Samsung hasn't released official sales figures, how well the Galaxy S6 and S6 edge have performed in the market is still a bit of a mystery. According to analyst, though, sales of the two smartphones have fallen short of their expectations. This is partly due to a logistical issue: Samsung apparently underestimated demand for the S6 edge model, and supplies of the model were limited. In addition, the S6 was initially too expensive, according to Francisco Jeronimo, research director at IDC. Overall, Samsung has struggled with shrinking profits and a decline in its smartphone market share, so the company could use a boost from the Note 5 and S6 edge+. Anticipated improvements include designs that follow in the footsteps of the Galaxy S6 and S6 edge. The Galaxy Note 4 was, with its metal frame and plastic back, a step in the right direction. But the metal frame and glass back on the S6 and S6 edge look better. Other expected hardware specs are 5.7-inch screens with a 1440 x 2560 pixel resolution. The screen on the Galaxy S6 edge+ will have curved edges just like its predecessors. Add to that a 16-megapixel camera on the back and a 5-megapixel camera on the front on both the S6 edge+ and the Note 5. Though the Galaxy S6 and S6 edge may be the best smartphones Samsung has ever developed, they aren't perfect. Like the Galaxy S5, they lack memory card slots and aren't waterproof. Samsung also decided to shrink the size of the batteries compared to the S5. Since the two new devices are expected to be based on the existing Galaxy S6 models, these perceived drawbacks (as well as a battery that isn't removable) aren't likely to change on the Galaxy Note 5 and S6 edge+. The expected addition of fast charging lessens the impact of a small battery, but Samsung needs to find a better balance between a slim design and battery size. For anyone in the market for a new phone, the second half of the year is already off to a good start with the launch of the OnePlus 2 from Chinese startup OnePlus, as well as Motorola's new Moto G and Moto X smartphones. And again, new iPhones are also around the corner. New Google Nexus models, and high-end smartphones from Huawei Technologies, LG Electronics and HTC are also anticipated to go on sale before the end of the year. For consumers looking to spend $400 or less and still get a great phone, the OnePlus and Motorola devices are good places to start. For consumers who just want the best possible performance, screens and cameras irrespective of the cost, the Samsung Galaxy Note 5 or S6 edge+ or the new iPhones will be the top candidates. Products launched during first half of the year shouldn't be forgotten. Price cuts on the G4 from LG Electronics and the Galaxy S6 have made them even more attractive. All things considered, Samsung has a lot to contend with.